Philip Giray came from Eritrea to Israel two years ago. He is one of some 60,000 migrants living in Israel. The scissors never seem to stop in Sami's barber shop off a pedestrian street in south Tel Aviv. Fresh out of the barber's chair, Philip Giray says he left Eritrea two years ago. Smugglers helped the 20-year-old cross into Sudan and Egypt. Then he snuck into Israel. "We come here, we ask asylum here, they doesn't welcome us," Giray says. "They punish us psychological, you know?" The number of people illegally entering Israel from Africa dropped from almost 10,000 in the first half of 2012 to just three dozen in the first six months of this year. Israeli officials, including Prime Minister Benjamin Netanyahu, credit a new fence that stretches across the country's southern border. But Giray and some 60,000 other migrants, almost all from Sudan or Eritrea, are already living in Israel. Now the government is about to experiment with new policies designed to separate asylum seekers from the rest of Israel. Giray came before Israel built its fence. As was usual then, the Israeli military picked Giray up, took him to a detention center for a few days, then turned him loose in south Tel Aviv. "They give us a bus ticket," he says. "I come here. I sleep over there in the park, in the street, for two months more. Then I start to work." Israel won't deport migrants from Sudan or Eritrea because of continuing violence in the region. But refugee advocates say the Israeli government has been slow to process applications for asylum. While people wait, the social services normally offered to refugees are unavailable. Their Israeli-issued papers say they cannot work, although the government generally looks the other way. "Israel is putting all these people in a legal limbo," says Asaf Weitzen, an attorney with the Hotline for Migrant Workers. 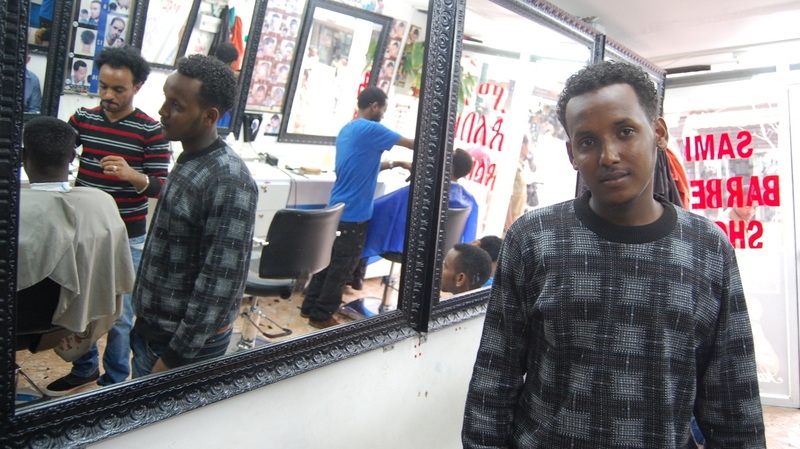 Many of the people strolling on the street outside the barber shop are men from Eritrea or Sudan. May Golan, a young Israeli woman who has lived here her whole life, says crime has risen and the quality of life fallen since the migrants arrived. "Listen, this was never a perfect place," Golan says. "South Tel Aviv always had problems. But never we were afraid to go out of our house at 5 o'clock in the afternoon to buy milk. Never." Golan has become politically active because of this issue. She believes nobody is listening to the needs of her neighborhood. "The Israeli government just sits quietly, holds her ears, her eyes and her mouth," she says. "I don't get (it). What are they waiting for?" The government has done a few things that May supports. In addition to building the fence across the southern border, Israel's legislature passed a law last year that put new illegal migrants in detention for three years. But in September, Israel's supreme court overturned that law. Human rights lawyer Weitzen argued the case on behalf of detained migrants. "The day we received this ruling and read it, we thought it's extremely significant," he says. "Today, almost two months have passed and we are afraid it's less significant than we want it to be." Now the government is coming up with new plans. According to an adviser to the interior minister, Israel wants to reduce the time any new migrants spend in detention to a year or so, and move the tens of thousands of Eritreans and Sudanese already in the country to new so-called "open" detention centers while they wait for asylum claims to be processed. Food, health care and training would be provided. People could leave during the day, but would have to sleep in the centers. It's not clear how many years they would stay. Former lawmaker and former ambassador to the U.S. Danny Ayalon says such an approach would serve two purposes. "First of all to deter other illegal work-seekers to come to Israel," Ayalon says. "And secondly to deal with those who did infiltrate in a humane way and prepare them to go back to the countries of origins, provided of course there is no life-threatening situation for them going back." The United Nations refugee agency is advising Israel on its next steps. U.N. guidelines allow the kind of centers Israel describes, if certain rights are met. The Israeli government is also looking for a third country to take migrants, and offering $5,000 to asylum seekers who are willing to leave. Yair Sheleg, a research fellow at the Israel Democracy Institute, says one reason the government doesn't want to absorb migrants from Africa is that they're not Jewish, and thus could change the country's demographics. "The Jewish people learned two important lessons from the Holocaust," Sheleg says. "On the one hand we learned the lesson (that) we should be moral, we should act morally, we should act by a universal code. The other lesson is that we have to strengthen our own national state."